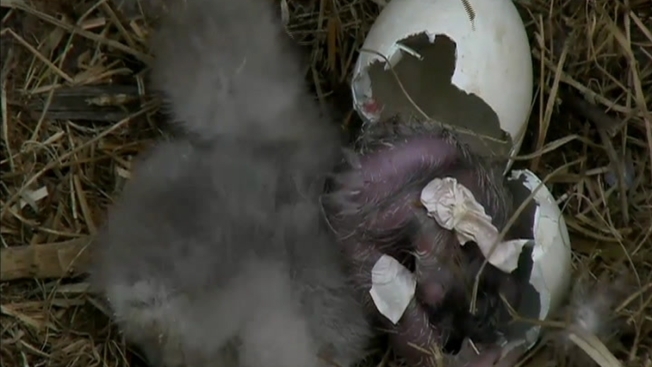 Raw video of the second eaglet hatching at the National Arboretum. The one-day-old eaglet at the National Arboretum has a sibling! A tiny new eaglet, known as DC5, hatched Thursday afternoon at the U.S. National Arboretum, just a day after it sibling, DC4. "DC5 is FAST! We're almost there!" the American Eagle Foundation posted on Facebook about 1:30 p.m. Thursday, accompanied by a photo of DC5 nearly all the way out of its shell. The foundation also provided an update on the newest addition's (slightly) older sibling: "DC4 is gaining strength and balance, and is getting better at feeding," the foundation said on its website. The eggs from which DC4 and DC5 hatched were laid Feb. 19 and Feb. 23 in a nest at the top of a tulip poplar tree at the arboretum. Since then, their parents have taken turns incubating them, even during a frosty late-season snowstorm earlier this month. The new eaglets are the 4th and 5th offspring of their parents, called Mr. President and The First Lady -- the first bald eagle pair to nest at the Arboretum since 1947. They first nested at the site in 2015, raising one eaglet. Last season, they raised two, initially called DC2 and DC3 before they received their official names of Freedom and Liberty. The D.C. area was captivated by the tiny eaglets as they grew -- and it seemed to happen all too quickly. The eaglets took their first flights at 11 weeks old.